A convicted killer murdered a property developer after being released from prison on licence, an inquest has heard. John Gogarty, 65, was stabbed 69 times by Ian Birley at his home in Marsh Street in Wombwell, Barnsley, in 2015. Birley was classed as medium risk on his release from prison, having murdered a Barnsley pensioner in 1995. South Yorkshire Police told the inquest the force had been "unaware" of the killer's release conditions. At the time of his release in December 2013, the National Probation Service sent a report to the force detailing Birley's address and licence conditions, including one stating he should not drink alcohol. But the report was not logged on police systems, the inquest, secured by Mr Gogarty's daughter Nicola, heard. 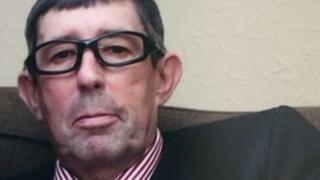 Mr Gogarty's family appealed for the inquest to determine whether there were failings by agencies involved with Birley before and after his prison release. Birley and his then-girlfriend Helen Nichols broke into Mr Gogarty's home, stole his wallet and demanded his PIN before stabbing him, the inquest heard. They took £500 to pay Birley's drug debt and stole champagne before burning their clothes in a nearby wood. Mr Gogarty's body was discovered by his son four days later on 17 July 2015. Ms Gogarty told the inquest her father's death had "devastated the whole family". "In my heart I do believe my dad would still be here had things been done," she said. Birley was jailed for a whole life term in 2015 alongside Nichols, who was jailed for 20 years.